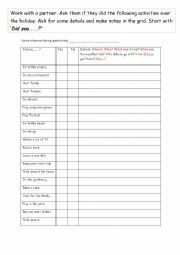 You could do this as a listening rather than reading activity. 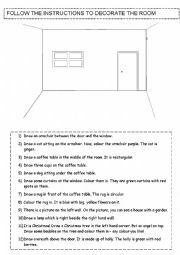 When they have finished, they compare their room with a partner´s and discuss the differences. It´s amazing how many variations there will be! Two pages, 10 chains, with key. I include a web address for more of the same. This was time consuming, but after these, I give my students the words and ask them to write the definitions. 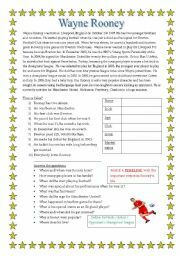 This is a brief biography of Rooney, with a true/false exercise, comprehension questions, grid for facts, and suggestion to make a timeline. 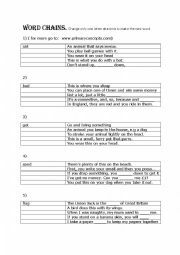 You could also blank out the verbs and use it to practise past tense. 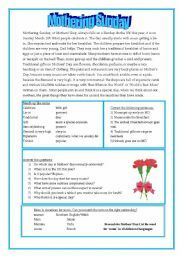 This is a speaking activity for pair work, with questions beginning with ´Did you..? Alternatively, it could be a written exercise wih students writing down their own answers. There is a match-up activity on page 2. Here are a few links to great pictures. Pinterest is a very valuable source of excellent pictures; worthwhile finding out how to navigate around it! An example of a useful picture, with some exercises is included. 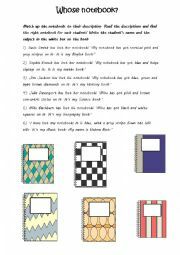 Match the notebook to its owner, then describe some notebooks. 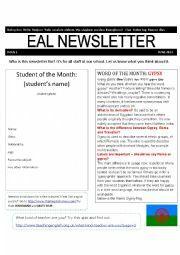 This a version of a newsletter I have done for the staff at our school. It´s fully editable. I hope some of you can use/adapt it. 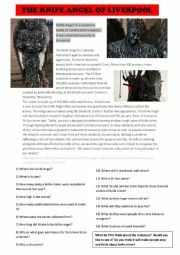 There are two pages of the newsletter and a model activity attached. Cheers! It´s Mothers´ Day in the UK soon. This is a short passage about it, with a true/false exercise, match the like terms, and some comprehension questions. Some questions for coming back after holiday. (Can be adapted to ´what did you do at the weekend? 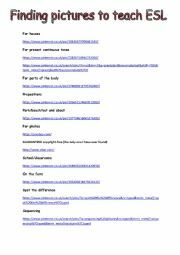 )´- apart from ´did you go abroad´-There are some examples and a match up on page 2. 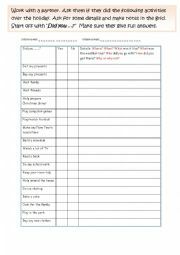 It´s set out for pair work, but could be given as a worksheet for each individual. This is a passage adapted from a news report. This ´angel´ has been unveiled recently. The language is quite difficult, but the questions should enable decoding. This thing makes me shudder!